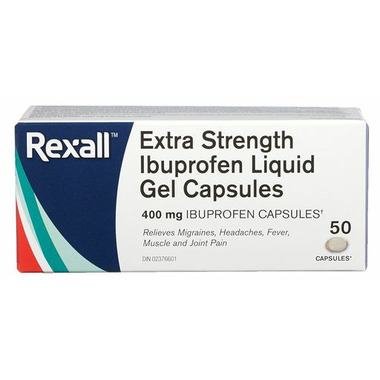 The Rexall Extra Strength Ibuprofen Liquid Gel can help relieve headaches, fever, muscle and joint pain. Dosage: Adults and children over 12: For migraine headaches, take 1 capsule at the first sign of symptoms, and every 4 hours as needed. For all other uses, take 1 capsule every 4 hours as needed. Do not exceed 3 capsules in 24 hours, unless directed by a physician.